New Jersey is on the road to online gambling games! Online gambling in the United States is a very delicate subject due to the regulations that limit the options for potential players. However, this doesn’t mean that US citizens can’t access some of the great online casinos and get their daily dose of excitement from the comfort of their own homes. The Box24 casino games not only look amazing but the site is also meant to target the US market which means easy-to-use deposit options and a very large welcome bonus to get new users started. With a federal bill allowing online gambling within the United States expired, some parts have taken upon themselves to allow companies to go online while regulating the activity in order to make things safe for the players. Atlantic City has been picking up a lot of momentum over the last few months and the gambling bill has recently been approved by the state assembly. 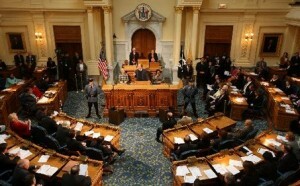 The New Jersey online gambling bill, A2578, was amended a few weeks ago in order to eliminate a clause in which all companies that offered online gambling games within the US before 2011 would be banned. This might have made the efforts to push for the bill more significant since PokerStars is already looking to get back in the market by buying a struggling casino in New Jersey. State Senator Ray Lesniak is very confident that the bill will also pass the next step and will end up once again in front of Gov. Chris Christie. A similar form of the bill was passed in early 2011 but Christie turned it down using his veto vote and it will be interesting to see how he will react this time around. This time, the bill only got 48 votes for and 24 against while 4 abstained which is less than the vote in 2011 when it got 63 votes for. The difference in votes is more likely due to Christie vetoing it last time which made it lose some support from Republicans. Although Nevada is also allowing online poker within the state, New Jersey has become the focus point for the gambling industry in the United States since the bill will allow all casino games that can now be found in the Atlantic City casinos. It is a pretty big step for the industry which will be stopped if a federal bill passes next year. Although this is quite unlikely to happen, the Reid/Kyl bill which expired for 2012 was looking to legalize online poker put ban any other forms of gambling on the internet. By making online gambling legal, the state will have a lot of power in regulating the activities and making sure that the customers are treated right while getting a percentage of the revenue in taxes. Online casinos in New Jersey would increase tourist traffic and will also offer more jobs to the citizens of the state. On the other hand, players will be able to play their favorite casino games on the internet but will only be able to access the licensed sites within the state without having the option to play on the international online casinos. It is still a very big step for online gambling in the United States and it remains to be seen if it will become a reality by the end of the year. Popular online gambling sites such as Slots Capital might even open their doors to US citizens once the regulations are in place. Until then, this new Slots Capital review can offer some insight into the great world of online gambling and show how an online casino is supposed to look like.